Madill Golf - Two Sisters. One Sport. One Passion. There are probably nearly as many golf blogs as there are golfers and our aim is to share our love of the game and, we hope, to amuse and entertain and, in Maureen's case, provide useful advice now and again. We started off in Portstewart, a small seaside town in Northern Ireland and thanks to golf now have friends all over the world. This is our way of saying hello to them all and reminding them of the fun we had and are still having. It's been a great walk, unspoiled. It’s Monday and it’s the morning after the night before. The rest of my colleagues from WestwoodOne radio have departed and I have a little bit of time to draw breath and reflect as I wait in our rental house for my lift to Atlanta airport. I’ve switched off the television and the endless post game shows the Americans like so much and, silence really IS golden, especially when you’ve spent the last four days with headphones clamped to your head and a dozen voices ringing in your ears all day long. The WestwoodOne broadcast crew for the Masters really do look after me! What, oh what have we just witnessed? 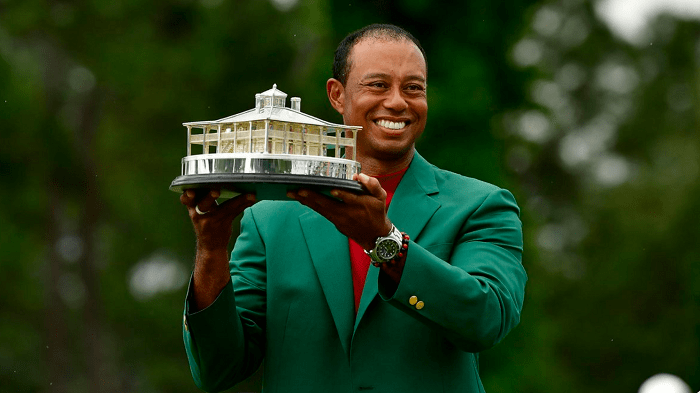 At its simplest, we’ve seen Tiger Woods win his fifth green jacket, his 15th major and a whole lot of cash. Did I think I’d ever see Tiger win again after the trials and tribulations (mostly self-inflicted) of the past decade? No, I didn’t. Did I WANT him to win again? Frankly, no, not particularly. I had too often witnessed him being arrogant and rude, acting with a huge degree of entitlement and scant regard for others. While his golf has always been mesmerising and a privilege to watch, especially in his prime, it has been hard to warm to the man himself. Life, however, has a way of knocking the corners off us all and that is certainly true of Tiger Woods. 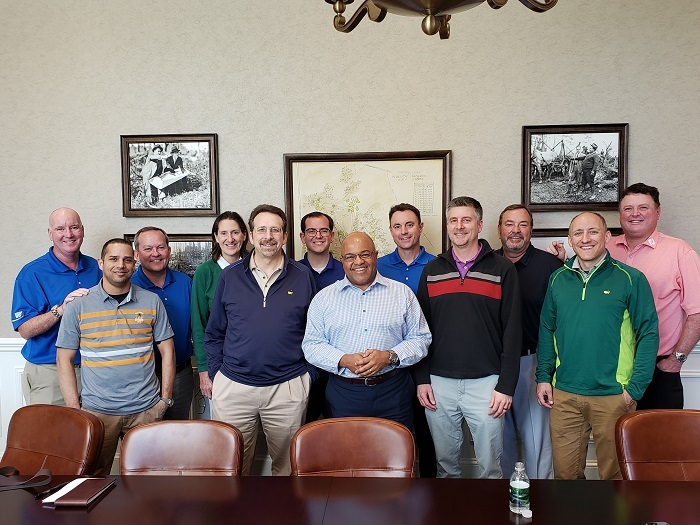 Two years ago he needed a nerve blocker just to make it to the traditional Tuesday Champions’ Dinner and he confided to a few that evening that he felt he might never play golf again. He left that dinner, boarded a flight to London and visited a Harley Street surgeon who convinced him that all might not be totally lost. There was one more surgery to try. Fast forward twelve months and Tiger was back at Augusta, but this time he was travelling with his clubs. There were so many unknowns. How would his body hold up? Could he ever be competitive again and in a major at that? The answers at the end of that week were cautiously positive. He finished in a tie for 32nd but the good news was he was getting stronger physically and ready to see if he could get a full season of playing under his belt. All through 2018 he was like a man setting out to walk across a frozen river, testing to see if the ice would hold his weight. The further he got into the season the more confident he became. The ice was holding! The walk, then the golf, became more assured and by the time he had finished 6th in the Open, was runner-up in the PGA and had won the Tour Championship most of his questions had been answered, emphatically. His dismal and exhausted Ryder Cup performance in Paris, however, served as a reminder to him that future scheduling would be key. So, back to Augusta twelve months later and only one of that raft of unanswered questions was remaining – would he ever win another major, the yardstick by which he, and therefore we, measure greatness in the game? Now we all know the answer to that. So, normal service resumed, you might say? Actually, no. Did you see the players waiting to congratulate him at the entrance to the recording area? Bubba, Brooks Koepka, Rickie Fowler, Xander Schauffele, Ian Poulter and Bernhard Langer amongst others? That welcome committee from his peers had been absent at his previous 14 major triumphs and is a huge clue as to how his interaction with his rival competitors has altered. Indeed, he paid tribute recently to the young American players for inspiring him to get out there and get playing again. It’s a very neat circle as Tiger was the one who originally inspired them as children to think that golf would be a really cool thing to try. It was also the first time his own two children, Sam and Charlie, had had an opportunity to see their father do what he used to do routinely. This may well be the major Tiger savours most – for lots of reasons. Tiger celebrates with his son Charlie who sees him win a major for the first time…and with his Mum Tida who sees him win his 15th. I was there in Augusta in 1997 when Tiger won his first major and I was there at his 14th win in Torrey Pines when he won playing on a broken leg. I was also there at loads of the ones in between. I didn’t expect there to be a 15th and I didn’t expect to be pleased for him, yet I am. The golfer is familiar but the man I see behind the golfer is different and for that I’m glad. I travelled to Georgia hoping to see an historic Masters, having in mind a Rory win which would make him the sixth member of that oh-so-exclusive club of players to complete the career grand slam. That wasn’t to be and it was a different narrative that was rolled out this second week in April. No matter, I can wait another twelve months – or as long as it takes – for Rory’s undoubted destiny because this week was special…..very, very special. Well, that old saw “all things in moderation” didn’t get much of a look-in at Augusta this year, did it? Certainly not on the Sunday when it was all hands to the pumps to avoid the apocalypse that the weather people had predicted – and which skirted the property but hit elsewhere with devastating effect. Instead of the mother of all storms we had a rip-roaring godmother of a Masters, a tournament of the ages for all ages. The early two-tee start seemed sacrilegious – and such a break with tradition at such a place was a sure sign that this wasn’t just any old weather warning – but the scrunched-up schedule added to the drama and sense of excitement. A host of players jostled up and down the leaderboard, more than a few of them genuine title contenders on the day that someone’s dream of winning a green jacket becomes a reality. Even I, cynical and hard of heart, couldn’t begrudge Tiger the sweetest victory of his star-studded career. Never mind his shot-making and touch, the man’s concentration and control were immense, impervious and made him indomitable. It was no wonder that, the last putt holed, the prize secured, he screamed, flapped his arms, hopped a bit, screamed again, hugged everyone, shook hands, then screamed some more and flapped again. He didn’t know what to do with himself. He’d given everything and the release of tension, all those years of pain, humiliation, frustration, everything, exploded in one ecstatic volcanic eruption. A man overjoyed and overcome. “We did it,” he said as he gave his caddie Joe LaCava a crushing bearhug. “You did it,” LaCava said. But Tiger was right, he couldn’t have done it alone. This was a team effort, a victory achieved through blood, sweat and tears, with the love and support of family and friends. No wonder their beaming smiles lit up an amazing Augusta afternoon. 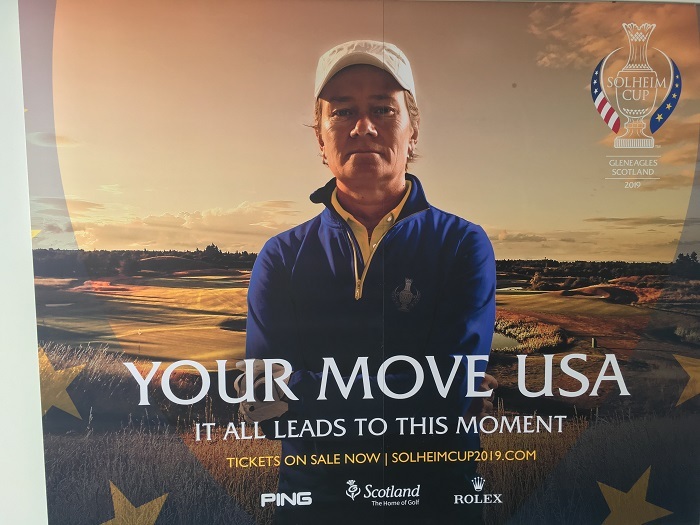 Catriona Matthew, Europe’s Solheim Cup captain, puts on the game face for a promotional poster. Juli Inkster, captain of the USA for the third time, is aiming for an unprecedented hat-trick of wins. 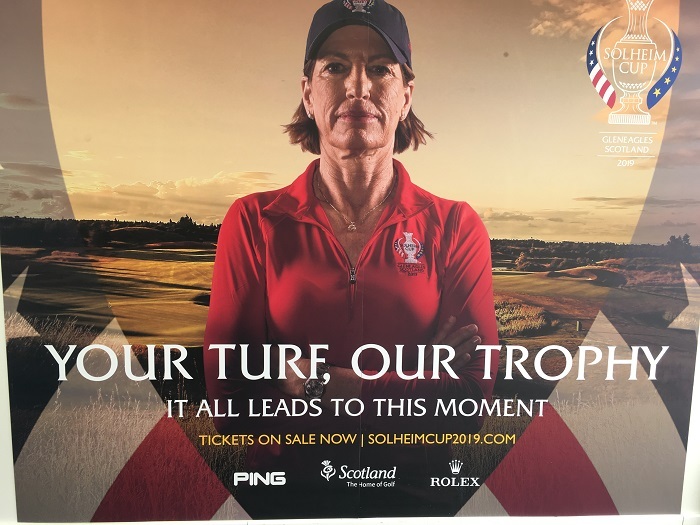 It may not match the goings-on in Georgia but there’ll be no shortage of emotion at Gleneagles in September (13-15) when Europe attempt to wrest the Solheim Cup back from the United States. 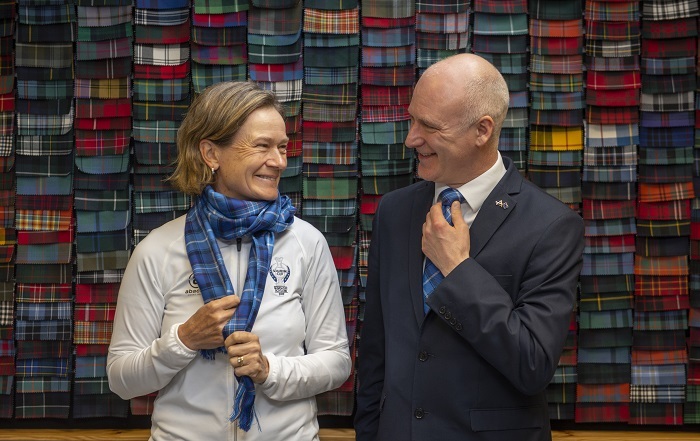 The Europeans, perennial biennial underdogs, have never lost in Scotland, with epic wins at Dalmahoy (in 1992) and Loch Lomond (2000), so it’s as well that captain Catriona Matthew, from North Berwick, has always remained cool and calm under pressure. Scotland now claims to lead the world in the development and promotion of women’s golf, so it behoves the rest of us to make sure that we keep up. And we don’t need to be superstars to enjoy golf or promote it. Today is the end of Golf and Health Week, which aimed to highlight how good golf is for our health and wellbeing and if you go to golfandhealth.org, you’ll see that it’s a lifelong thing, not just a fad or phase of the week. Marilynn Smith, one of the founder members of the LPGA, who died earlier this month, just short of her 90th birthday, thought golf was for cissies until her parents insisted she try it when they realised that playing baseball with the boys was doing nothing but harm to her vocabulary. She fell in love with the game and spent a lifetime promoting it and encouraging girls and women to play. Vibrant, enthusiastic, engaging, interested and interesting, Marilynn was also a player of no little skill, with 21 wins to her name and was inducted into the World Golf Hall of Fame in 2006. If you go to lpga.com, you’ll find Ron Sirak’s lovely tribute to Marilynn, a woman with a gift for friendship and a smile for everyone. 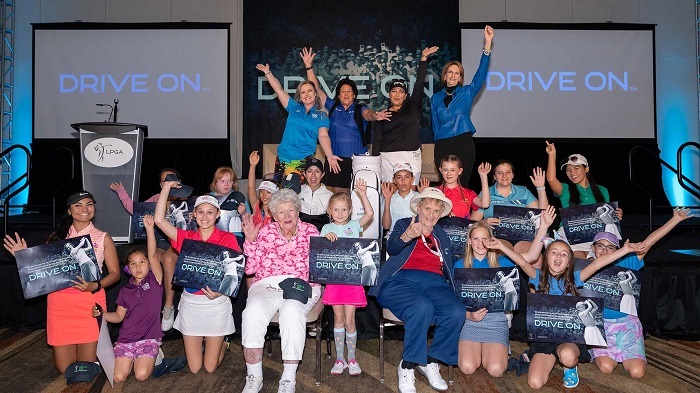 Just last month, at the Bank of Hope Founders Cup in Phoenix, Arizona, she and fellow co-founders Shirley Spork and Marlene Bauer Hagge were on hand to support and encourage today’s LPGA players and join in the Drive On initiative to get more girls golfing. Indomitable. Irrepressible. Inspirational. I wasn’t going to mention the Masters this week but that proved a ridiculous notion, given that I’m writing this with the radio on (European football chat at the moment) and the telly turned to face the writing table while I screech, “Relax Rory, relax….” Then he holes a putt to go 1 under (after being 2 over) and I roar as though Spurs have won the European Cup (or Champions League as it’s misnamed now) – and it’s only the first round. Relax Rory, relax. Keep calm, dear, it’s only the Masters. In my heart I fear that Rory will never win the Masters (think Sam Snead or Phil Mickelson with the US Open, Arnold Palmer and Tom Watson with the PGA and any number of other examples of players who could’ve, probably should’ve won the championship dearest to their heart). 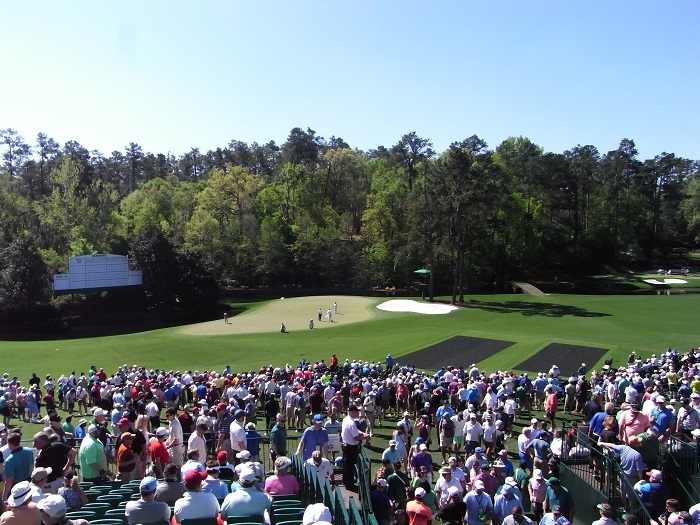 I hope I’m wrong – my predictions usually are – but Augusta National is a very swirly place, with movement everywhere, in the trees, on the greens and in the crowd and it’s hard to keep the mind still. The spectators (or patrons), controlled though they are, may not run but they’re always moving and there’s always a buzz; it’s not an arena for the faint-hearted or the rabbit-eared. Colin Montgomerie, who could hear a pimento cheese sandwich (which clogs the teeth) being chomped at 1,000 paces, never quite adapted. One year, when in his pomp, he was playing behind Arnie, who had left his playing pomp far behind but still commanded a fair number of troops who followed his every move, oblivious to anyone else. Hope these patron people are quiet enough for a Monty. The 11th hole. At the 5th, Monty was surveying his third shot, from the right-hand side of the green, maybe pin high but awkward, as most chips are at Augusta, when he stepped back, hands on hips and glared towards the (distant) 6th tee. Arnie’s group had hit their tee shots and the Army had set off down the hill towards the green. They were at least 50 yards, probably more, from where Monty was standing, affronted, glowering at the unsuspecting retreating backs. Whatever the opposite of Zen is (Apoplectic? ), that was Monty. In my defence, the question wasn’t really facetious, it was more or less serious. Because that’s what Augusta requires: a lot of deep breathing. To win at Augusta, your game has to be in good shape, you have to hole more than your fair share of heart-stopping putts in the three to six foot range and, crucially, your head has to be in the right place. There’s no let up. It tests every last ounce of your skill and nerve. Every shot. Every putt. Every hole. Every round. No wonder green jacket almost rhymes with plum knackered. One person who’s probably still wondering what all the fuss is about is Jennifer Kupcho, of Colorado and Wake Forest (Arnold Palmer’s alma mater), who won the first Augusta National Women’s Amateur by playing the last six holes in five under par for a round of 67. 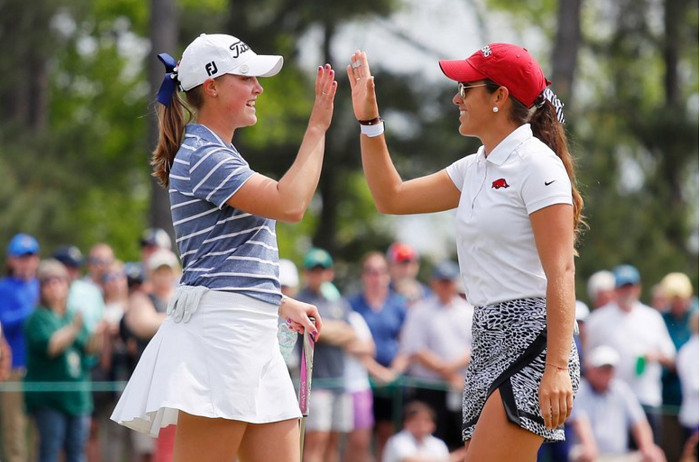 The world’s No 1 amateur started her winning charge with a stunning eagle three at the 13th and the golf she and Maria Fassi, of Mexico and the University of Arkansas, played lit up an event that is a bit of a misnomer but should get better. Only the last of the three rounds was played at Augusta National and it clashed with the women’s ANA Inspiration, the first major championship of the season, at Mission Hills in California. That event was won by Jin Young Ko, of South Korea, who’s now world No 1 in the Rolex Rankings. It was her first major title but Dave Brooker, her caddie, an Englishman who can now be called a veteran, was celebrating his third victory in this particular desert. He won the title with Grace Park in 2004 and Lorena Ochoa in 2008. Many congrats Dave. Congrats to everyone involved in an event that shows golf really is for all.